Communicating during an emergency may be difficult because of an injury, disability, or language barrier. These communication aids can help people communicate their needs to others. Temple University’s Institute on Disabilities created a letter and word/phrase board to be used by, and with, someone who needs communication assistance and who can read and spell. Personal information can be listed on the back of the word/phrase board by the individual, family member, a support person, a doctor, or by an emergency responder. 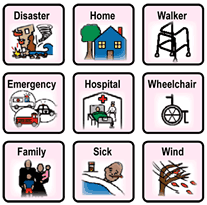 The institute on Disabilities at Temple University provides a picture communication aid with important words and phrases for use during emergencies. The back of the picture board has spaces for individuals to write in important information such as contact names and numbers, medications, and the possible equipment and supports needed to maintain independence.